Three nationally acclaimed journalists will participate in a discussion of the challenges facing the news media in covering the Trump administration during a panel discussion on March 9 at 5 p.m. at the Stackhouse Theater, Elrod Commons on the Washington and Lee University campus. The panel, titled “Alternative Facts and the Search for the Truth: Journalism in the Age of Trump,” is free and open to the public.It will be live streamed. Olivia Nuzzi, the Washington correspondent for New York Magazine, covers the Trump administration and Congress. She formerly worked for The Daily Beast, where she covered politics and Trump’s presidential campaign. She also has written for GQ, Esquire, Politico Magazine and The Washington Post. Rosie Gray writes about U.S. politics and global affairs for The Atlantic. Gray formerly worked for BuzzFeed News, where she covered two presidential campaigns and foreign policy. Before that, she worked for the Village Voice, where she wrote about politics and other news. Michael Hudson is a senior editor at the International Consortium of Investigative Journalists. A member of the Class of 1985 at W&L, Hudson is a former Wall Street Journal staff reporter. He also worked as a reporter, writer and editor on ICIJ’s “Panama Papers” investigation, which exposed how a law firm based in Panama had helped kings, prime ministers, drug barons and others set up offshore companies. Hudson is the recipient of the Overseas Press Club Award and three George Polk Awards. 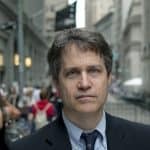 He is the author of “The Monster: How a Gang of Predatory Lenders and Wall Street Bankers Fleeced America—and Spawned a Global Crisis” (2011). Associate Professor Paul Gregory is head of W&L’s Department of Philosophy. Gregory’s research focuses on the justification of naturalized approaches to philosophical questions. He is the author of “Quine’s Naturalism” (2011) and is working on a textbook about introductory and intermediate symbolic logic. Professor Toni Locy is head of W&L’s Department of Journalism and Mass Communications. As a journalist, she covered legal issues for some of the nation’s largest news organizations, including The Washington Post, USA Today, The BostonGlobe and The Associated Press. She is author of “Covering America’s Courts: A Clash of Rights” (2013). The event is sponsored by W&L’s Department of Journalism and Mass Communications, along with the Donald W. Reynolds Foundation.